I Need A Face Lift, Doc! Case Study: J. Milan & Co.
J. Milan & Co. specializes in creative packaging and displays for major brands like Anheuser Busch, yet their digital presence created a disconnect in their purchaser’s minds. The old brand look and feel lacked the pop and pizazz that the company expertly exuded in their packaging and display products. J. Milan & Co. came to Clicked Studios to fix this problem and help them bring their entire digital presence in line with the same standard of excellence seen in their products. Clicked Studios and J. Milan & Co. worked through our strategic framework to pinpoint the critical points that make them stand out from their competitors. With this strategic direction in hand, we crafted a new brand image for J. Milan & Co. so always make a great impression on purchasing agents, no matter how big the company! 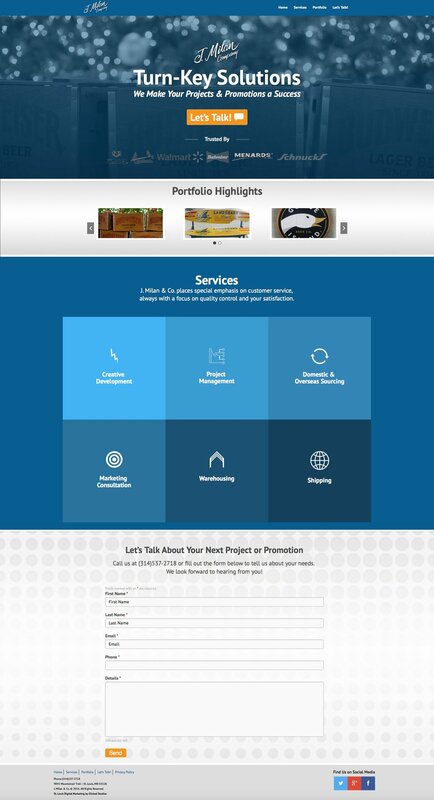 This new look and feel was then implemented as a brand new responsive website design to serve a great user experience from smartphones to laptops to desktops. © 2019 Clicked Studios, LLC. All Rights Reserved.